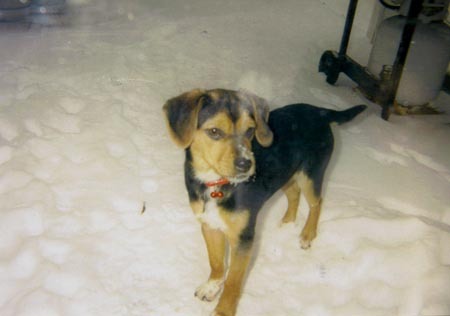 Well my dogs name was Jack we adopted him in December 2004. Now Jack's new name is BeeGee the reason is because we couldn't find a new name for him so we were watching TV and a commercial went by about the Bee Gee's old hits and my little sister said "hey what if we call him BeeGee" Jack came to the name when she said it. well just knowing that he would respond to BeeGee we decided to keep the name. BeeGee now is healthy and loves to run and play with the family and other dogs. Ever time we get him a new toy he seems to go right at it and plays with it as if it were alive. we love him so much and this summer of 2007 he will be traveling with us to California. here is a picture of our BeeGister as an attachment.